I arrived at Hedonism to be greeted by none other than Prince Robert of Luxembourg who would be hosting the tasting. “Good evening, Robert of Luxembourg”… I thankfully refrained from replying “Alex of New Malden, lovely to meet you”. I fear New Malden lacks the gravitas of Luxembourg. The tasting was as expected, exceptional, with wines from the three Dillon Clarence properties ably presented by the winemaker Jean-Philippe Delmas: Haut Brion, La Mission Haut-Brion and Chateau Quintus. The first thing that struck me is that the Bordelais have the most fantastic poker faces. Vintages ranged from ‘excellent’ (2010) to very good for the questionable 2011, a statement which prompted a rye eyebrow raise from yours truly. Apparently Bordeaux don’t have bad vintages. The one thing that was reinforced by this tasting was the clarity with which these properties spoke of both terroir and vintage. 2012 on the right bank was glossy, powerful yet fresh and elegant. 2009 La Chapelle de la Mission Haut-Brion was wonderfully perfumed, seductive and captivating, a murmuring of appreciation rippled across the room as people acquainted themselves with the wine. 2006 La Mission Haut-Brion, a powerful, concentrated wine was true to form a Marmite vintage with chewy, austere tannins that were making it clear just how much they had struggled with the previous year’s drought and that year’s vagary of heat and rain. 2004 Haut-Brion was beautifully evolved and showing itself in all its aromatic glory as notes of cedar, tobacco, mulch and subtle scented cassis enveloping the senses. Though clearly it had the ability to continue developing it was comfortably ensconced in its drinking window. No infanticide there as is so often the case in a tasting of top wines. The tasting culminated with the whites and the rose. The rose was surprisingly good showing a perfect combination of concentrated summer berries, vibrant acidity and elegance. The well-meaning and somewhat inevitable “this pale rose is perfect for the ladies” caused a moment of awkwardness as the gentlemen present looked uncomfortably to the few ladies who all wore ‘oh really?! !’ expressions, whereupon one jovial gentleman piped up with a twinkle in his eye; “not just the ladies, I am partial to rose myself”. Bless him! Something that really struck me again was how underrated white Bordeaux is. The Clarté de Haut-Brion really was a lesson in depth, texture, aromatic excitement and spine tingling freshness. All in all it was an exceptional tasting deftly presented. It is clear just how much energy, passion and investment is continually put into these properties to ensure they remain the epitome of quality. I will certainly be keeping an eye on their latest vinous child, Chateau Quintus as it comes into its own. This year I celebrated the big 3-0. Whilst for me 1983 was obviously a very important year, in wine terms it was a middling year, with some good wines made in many regions but without the greatness of, say, Alex’s 1982 vintage – hailed as one of the best in Bordeaux. 1983 was, however, a widely declared year for vintage port – something my siblings cottoned onto when they bought me a (delicious) bottle of Grahams 1983 for my 21st birthday. A few years ago when I was working at The Sampler I realised this milestone of turning 30 was ahead and thought how nice it would be to squirrel away a few bottles of 1983 to celebrate my birthday. If you don’t know The Sampler, it’s a great independent merchant in London which generally has good stocks of older vintages of wine, sourced from private cellars, auctions and the like. So as 1983 wines appeared I would buy the odd bottle and put it to the bottom of my wine rack to keep until 2013 rolled around. Added to this my Dad kindly offered a few bottles out of his cellar so soon enough I had 7 bottles covering white, red, sweet and port. Enough for a good party. 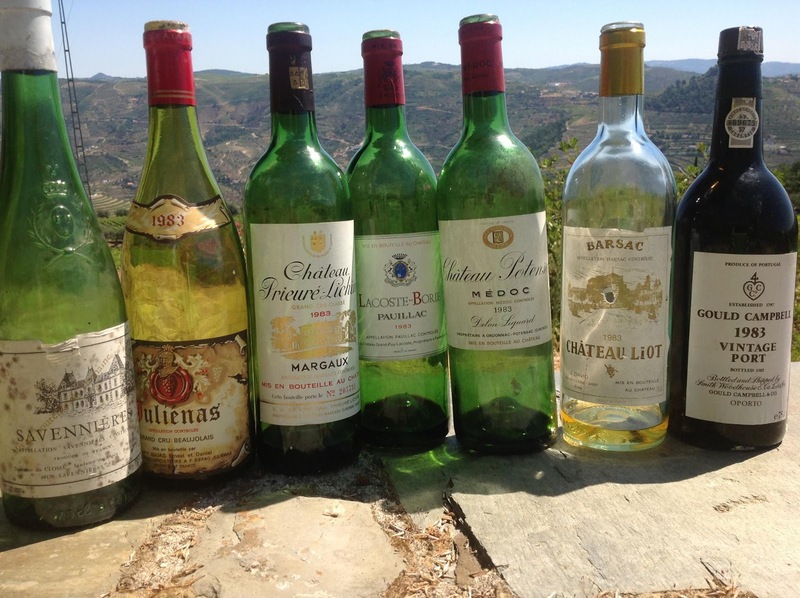 Perhaps unsurprisingly, quite a few of my friends turned 30 this year too and as we were all heading out to the Douro in Portugal for a group holiday this summer I suggested bringing the bottles along and all celebrating together. Which is what we did, carefully packing the wines into polystyrene tubes in our suitcases so our precious cargo would arrive safe and sound. First up was the white, served with some home-cured salmon. Savennieres is a region in the Loire Valley of France which produces white wine from Chenin Blanc. Whilst it is known for its age-worthiness and I have had lovely examples at 10-15 years old, I have to admit to being prepared for this to be completely past it. But I am happy to report it was still going strong. There were certainly some savoury mushroom notes hinting at the age, but these were underpinned by vibrant acidity and even some lingering citrus fruit and honey character. A real surprise, just wish I had another bottle! Next up was the Beaujolais. Again I had real doubts about this wine being drinkable –Beaujolais is usually drunk whilst young and fruity and whilst it can age and develop almost Pinot Noir-like earthy aromas, 30 years was surely pushing it. It wasn’t quite the surprise that the Savennieres was, most of the fruit had indeed faded, leaving the acidity a little clunky and out of balance. But, it was far from undrinkable and still possessed some elegance. Overall an interesting wine to taste, but not one anyone went back to. The trio of Bordeaux came next, nicely matched by Beef Wellington wrapped in parma ham rather than pastry. The Prieure Lichine certainly had the elegance you’d expect of Margaux, but I felt that it didn’t have the tannins to quite hold up to 30 years of age. It still had some pretty fruit but finished rather short. Enjoyable enough to drink, but not to savour. The next two pretty much split the table for top red of the night. For me the Lacoste Borie pipped the Potensac to the post. The Potensac probably had more lingering fruit – on the front palate there was still a lot of blackcurrant fruit, pretty impressive for a 30 year old wine. However, after this burst of fruit it became a bit bitter and finished quite abruptly. The Lacoste Borie had a lovely mix of more evolved savoury fruit and earth notes and fine tannins and was the one I went back to. Onto the pudding course – which was actually a very fresh summer pudding and not the greatest match with Barsac so we enjoyed the pudding and then had the wine separately. Bright gold in colour with honey, marmalade and mushroom notes and bright acidity to balance the sweetness, really all you could want in a pudding wine. A winner for everyone. Then finally onto the port which we had carefully decanted earlier in the day. Surprisingly perhaps this was the only cork to crumble as we pulled it out, a butlers thief sadly not to hand. You’d think in the home of cork forests that the port would have the best cork of the bunch, but sadly not. Whilst it seemed a bit crazy to bring port to the Douro, it was lovely drinking the wine in the region where it was produced many years before. Velvet textured with layers of dark raisin fruit, savoury earth and spice notes and that warming feeling of port. Delicious and a superb end to a great meal.